The “Big Dipper” after restoration to “Shoo Shoo Shoo Baby” before going into the US Air Force Museum collection. The aircraft was accepted into the U.S. Army Air Forces inventory 0n January 19, 1944, and arrived in Great Britain on March 2. After depot modifi cations, it was flown to the 91st Bomb Group at RAF Bassingbourn on March 23 and began flying missions the next day. 2nd Lt. Paul C. McDuffee was the first pilot assigned to the aircraft and fl ew 14 of his 25 missions in it, but nine different crews flew it on missions. The plane flew 24 combat missions from England with the 91st BG, with three other missions aborted for mechanical problems, before being listed as missing in action on May 29, 1944. On its fi nal mission, to the Focke Wulf aircraft component factory at Poznan Poland, it made an emergency landing at Malmo airport (Bulltofta) Sweden. The crew had been formed April 26, 1944 from replacements and had fl own fi ve previous mi sions together, all in aircraft other than Shoo Shoo Baby. “Soon after we crossed the German border, we lost number three engine, I believe because of losing oil pressure. Bob could not get the prop feathered (rotated 90° to put the blade edge pe pendicular to the airflow). It continued to windmill (turn without power in the airflow) the entire trip with no vibration. We attempted to stay in formation with three engines but found this i possible and had to drop out. We continued on course to the best of my ability. We were losing altitude but continued to the target and dropped our bombs. Flying alone toward the Baltic Sea, we saw many German fi ghters attacking formations of B-17s and could not understand why they didn’t pick us out as a stra gler. Before we reached the Baltic Sea, we lost the second engine, and the decision had to be made to go to Sweden because we could not make it back to England. Bob asked for a course to Sweden, and I charted one to a little town called Ystad in the very southernmost part of Sweden. All loose equipment, including machine guns, radio equipment, and clothing, was thrown overboard in order to lighten the ship. An attempt was made to drop the ball turret, but it wouldn’t move. Sweden, a neutral country, interned the crews and aircraft, that diverted to the country. A deal was made between the Swedish and U.S. governments to permit around 300 American crewmen to be repatriated in exchange for a promise not to use the crewmen in combat again and to formally turn over to Sweden nine B-17s that had landed intact. Second World War had put an end to the burgeoning civil aviation across the Atlantic. Before the war the route was fl own by fl ying boats. Now it was realized that the future lay in the land-based aircraft. In order to be prepared for the transatlantic traffi c after the war ABA/SILA in 1943 had ordered DC-4 from Douglas in the USA. Due to the war the delivery time was very uncertain. It was necessary to solve the problem of aircraft by other means. From 1943 onwards, a large number of B-17 Flying Fortress and B-24 Liberator, made emergency landings in Sweden following the bombing of Germany. 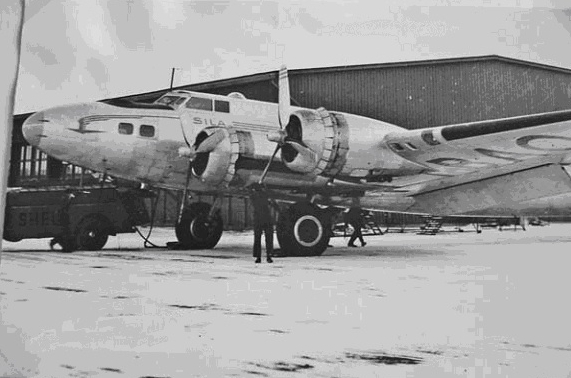 ABA/SILA (SAS) realized the opportunities to convert the B-17 to the passenger and cargo traffic. That could be used as Atlantic Transport as soon as the war ended. 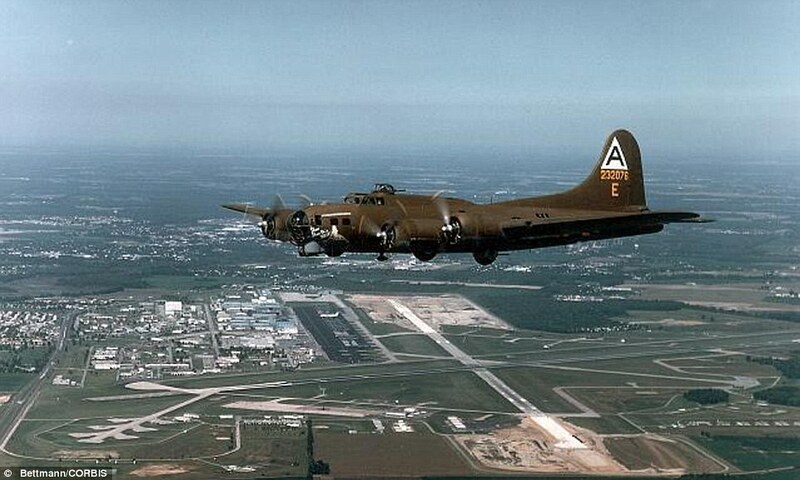 The B-17 was an aircraft with a substantial range, which could fl y at higher altitude than the DC-3. The Swedish government got involved and applied to the Americans to purchase or rent some “Fortresses” The Americans were willing to help Sweden. This was largely due to the fact that Sweden has taken good care of American pilots and helped them return to United Kingdom. It was decided that the five B-17, and later five more, would be put to to the Swedish govern-ment’s disposal. It was considered as a loan. When the war was over, Sweden could buy them at the price they had before the renovation They would be appropriated by ABA/SILA (SAS). As most people know, the Americans gave them to the Swedish state as goodwill. 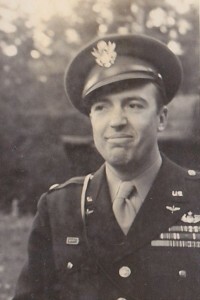 The aircraft was called B-17 Felix after U.S. Air Attache in Sweden, Felix Hardison. The planes were sent to Svenska Aeroplan A.B. in Linköping, where 7 were converted to passen-ger planes, while the remaining 2 were cannibalize for parts. First, all armament inc. turrets and armor removed, then the actual rebuilding could begin. 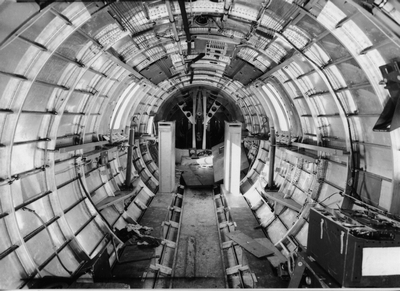 This included an extension of the nose of 50 cm, through a pivoting nose tip sheet a cargo of 1.8 m3, the former bomb bay was converted to a cargo hold, with the left bomb bay door secured in the closed position and reinforced so it could carry 3 tonnes of cargo and at the right bomb bay door was arranged with a lift that could carry 2 tons. Behind the left seat was the navigator and radio operator, while behind the right seat was seats for thr aircraft engineer flight engineer. In the original radio booth there now was a first class cabin with room for 6 passengers and the rest of the body was arranged as a second class cabin for 8 passengers. At the back of the cabin there was room for a small toilet. In addition, they installed extra windows in passenger cabins. This rebuilding lasted 5-6 months and the cost of conversion of all 7 aircraft was about. 450,000 Danish kroner, $ 90.000 with todays exchange rate. 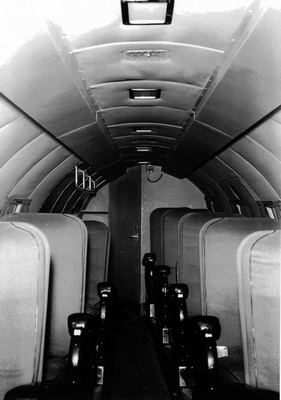 Economy class (8 seats) in the Felix B-17. Felix had a four-man crew and could carry 14 passengers and 3 tons (6600 lbs) of cargo, bag-gage and mail,with a maximum range of 1800 km (1118miles). The aircraft had a modest load at max fuel load: With an empty weight of approximately 16400 kg (36080 lbs), 7575 kg (16665 lbs) of fuel, oil, 490 kg (1078 lbs), 560 kg (1232 lbs) crew, there was 1 040 kg (2288 lbs) left for paying passengers. This added up to a maximum take off weight 26 000 kg (57200 lbs). Since carrying mail was a very profitable business, there was not much weight left for paying passengers. The available seats were high priority and was priced thereafter. When the war ended, the borders opened upo again and ABA/SILA (SAS) started to fly to the United States. On June 13, 1945 began a test flight with SE-BAK to Meeks Airfield on Iceland to gain operational experience of the Atlantic Transport. Yet another test flight was done to Ice-land, before it was time for the U.S. premiere. On June 27,1945 SEA-BAK fl ew to the U.S. via Keflavik, on to the Mingan Airport in Quebec (since closed) and landing La Guardia two days later. On July 4, 1945 it returned to Bromma, Sweden. In 1945, SILA made 26 return trips to the United States. It was decided to stop in Gander Newfoundland or Goose Bay Labrador instead of Mingan. On these flights a total of 52 passengers and 12 tons (26400 lbs) of mail/cargo from Stock-holm to New York. 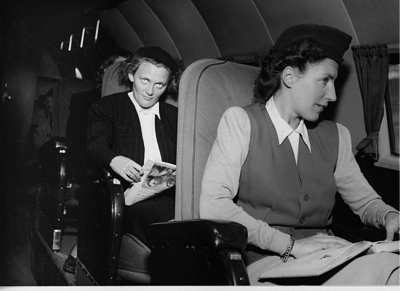 On the return trip NewYork/Stockholm, the number of passengers was 75 and 17 tons (37400 lbs) of mail/cargo. This clearly illustrates both the low load, and that pas-sengers paid less than the mail/cargo. Douglas DC-4’s were Introduced in the summer of 1946 on the Atlantic route to the U.S. It offered a completely different comfort and economy could take 28 passengers. Atlantic traffic was over for the B-17 Felix, and it made only fi ve trips to the U.S. during 1946. Swedish Intercontinental Airlines, was an airline and is today a part of the SAS Group. SILA was established in 1943 under the name Svensk Interkontinental Lufttrafik AB by the Wallenberg family to start a flight between Sweden and England. The first CEO of the airline was Per Norlin. 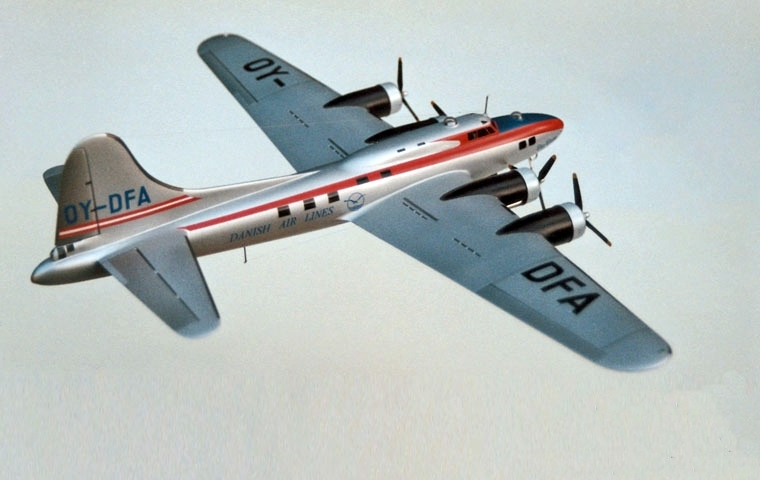 In 1943, he signed a contract with Douglas to buy 10 DC-4 with delivery when the war had ended. The first civil flight between Europe and USA was in June 1945 with a modified Boeing B-17 Flying Fortress with stops at Reykjavík and Newfoundland. 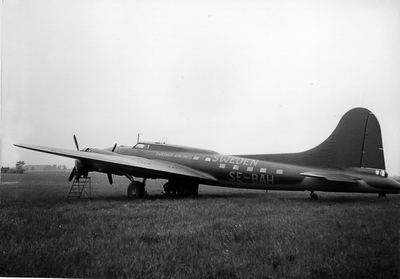 During spring 1946, the B-17 was replaced by Douglas DC-4s.In 1946, SILA became the Swedish part of SAS and in 1948 the airline was merged in to AB Aerotransport in 1948. ABA was established in 1924 under the name Aktiebolaget Aerotransport by Carl and Adrian Florman. The first flight was on 2 June 1924 between Stockholm and Helsinki with a Junkers F.13 aircraft. The aircraft, registered as S-AAAC and later as SE-AAC, is now on display at the National Museum of Science and Technology in Stockholm. In 1925 the company started a route between Stockholm and Berlin in co-operation with Lufthansa and a mail route between Stockholm – Malmö- Amsterdam – London. ABA was the fi rst airline with three-engine passenger aircraft when in 1925, ABA bought three Swedish Junkers G.24 from AB Flygindustri. During the following years ABA used and bought several different aircraft (e.g. Junkers F.33, F.34, G.23, G.24). For the longer routes a Fokker F.XII was used. In 1937 ABA became the second European operator of the Douglas DC-3 after KLM. This opened opportunities to fly longer flights, for example to Moscow. In 1939 ABA started to mark their aircraft with Swedish Air Lines. During World War II ABA tried to maintain their network, but in 1941 the route to Moscow was closed, and the route to Berlin ceased in 1945. During the war ABA had a courier flight between Stockholm and Scotland. After the German occupation of Europe ABA started new routes to Paris, Oslo and Prestwick. In June 1948, after a Swedish report, the government owned ABA and privately-owned SILA were merged on a 50-50 basis, to form a new airline named ABA .SILA had become the Swedish part of SAS in 1946, that was at that time only a co-operation between DDL in Denmark and DNL in Norway. On October 1, 1950, representatives from the three airlines signed a consortium agreement where they appointed SAS to run the airline operations and the three national airlines only to be holding companies. On November 2, 1945, SE-BAP performed test flights and November 6 the aircraft was transferred to Heathrow Airport and surrendered to the Danish Air Line (DDL). Here it was registered OY-DFA and named “Stig Viking “ and on November 13 the aircraft was deployed in flight on the UK – Copenhagen route. 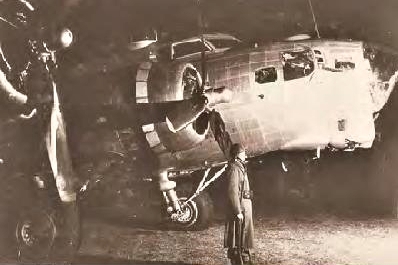 During arrival to Blackbushe Airport on 28 November 1945, with 22 persons aboard, the left landing gear would not come down and the pilot executed a one wheel landing with little damage and no injuries. In September 1946 “Stig Viking “ was used on the Copenhagen Nairobi in route, which from February 1947 was expanded to Johannesburg in South Africa. 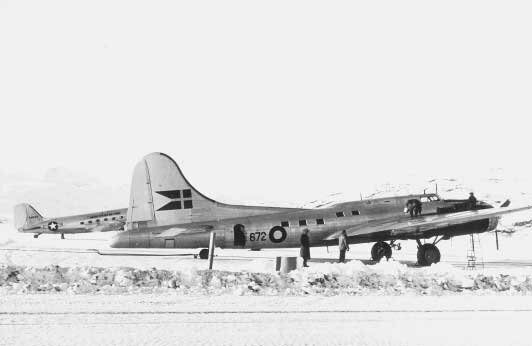 In late 1947 the Danish Army Air Corps started to look for an aircraft that could be used for aerial photography assignments on Greenland for the Danish Geodetic Institute (DGI) and in April 1948 they purchased B 17G OY-DFA “Stig Viking” from DDL. RDAF 672 B-17 “Big Dipper” at Kastrup Airport Denmark. The plane was rebuilt with 3 cameras in the nose – one for vertical shots and two to oblique recordings – plus space for a photographer behind a pivoting glass covered nose. An additional 1,400-liter fuel tank was installed in the bomb bay, and fi nally the plane got the registration 67-672 and was named “Store Bjørn?”, “Big Dipper”. In 1949 it flew a navigation tour to Sweden and Norway, went to Greenland and Canada to examine the route and alternate aerodromes. After returning the plane had an overhaul, and from July to September it was stationed on Greenland, where it flew a total of 108 hours of aerial photography for GI. When the Navy vessel “Alken” disappeared on Greenland, “Store Bjørn” assisted in the search from 23 October – 12. November and flew 48 hours total as a SAR aircraft. 1950 was a busy year, from July to the end of September it fl ew a total of 137 hours of aerial photography. Moreover, on the 14th-17th September it flew again as a SAR aircraft for 25 hours in search of Loftleiðirr’s missing DC-4 “Geysir”. This DC-4, called “Geysir” crashed on the middle of Vatnajökull on September 14, spurring a famous rescue operation. For four days no-one knew where the airplance had crashed or if there were any survivors. In fact, the whole crew survived, and as the plane had been carrying cargo at the time there were no passangers. Mestersvig is a military outpost with a 1,800 m gravel runway located in in Scoresby Land, on the southern shore of the King Oscar Fjord in Northeast Greenland National Park. It used to be the only permanent settlement in Northeast Greenland National Park but all of the 1986 popu-lation of 40 has been split up into the three newer Northeast Greenland National Park settlements (Danmarkshavn, Nord and Daneborg) except a permanent population of two people, although tourists visit the station occasionally. From 1956 to 1963, Mestersvig was a zinc and lead mine. )with the main purpose of construct-ing detailed topographic maps in connection with the lead-zinc prospecting. Oblique aerial pho-tography was also carried out over much of the region between latitudes 69°–81°N in the years 1950 and 1952. 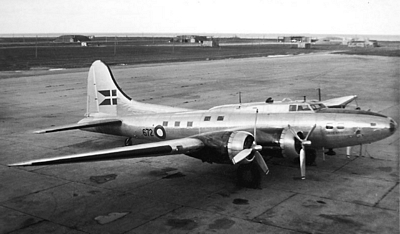 After the Royal Danish Air Force was established in 1951 “Store Bjørn?” was assigned to 721 Squadron at Air Base Værløse. It fl ew a rescue fl ight to Greenland to evacuate a seriously injured man. During the summer photo flight on Greenland, June to September the weather was not co-operating and only 56 hours of aerial photography was flown. In 1952 54 hours of photo flight was done again on Greenland. When the great flood disaster in Holland happened in 1953 “Store Bjørn?” flew blankets, boots and rubber boats from Heathrow to Valkenburg. During the summer Greenland flight, from June to September it flew a total of 101 hours of aerial photography for DGI and on the first October 1954 The plane was officially decommissioned. The plane was in storage for two years and was then sold to the Institut Geographique National, a French aerial mapping company based in Creil outside Paris, where it flew under the civilian registry F-BGSH. After the sale to IGN 67-672 again modified so that it would corresponded to the rest of IGN’s B-17 the installation of 2 cameras in the belly for Aerial Photography Survey. IGN put the aircraft into service in January 1956 with registration FBGSH and used it for aerial photography until 15 July 1961, where the aircraft flew its last trip and was stored in a corner of the airfield Creil with a total flight time 3364 hours. Here, the plane was slowly cannibalized to keep IGN’s other B-17 flying. Last flown in July 1961 the aircraft was tracked down by Steve Birdsall, a noted military aviation historian from Australia. The remains of the plane were donated to the U.S. Air Force in 1972 when French offi cials presented the B-17 to Secretary of the Air Force Robert C. Seamans for preservation. The journey from France required the assistance of the United States Air Forces in Europe to disassemble and crate the plane for truck shipment to Rhein-Main Air Base in Germany and the eventual airlift to the United States by C-5A transport. Among those greeting the aircraft on its return were its wartime pilot Paul McDuffee, who had become an insurance salesman in Tampa, Florida, and retired USAF Major General Stanley T. Wray, the fi rst commander of the 91st Bomb Group. 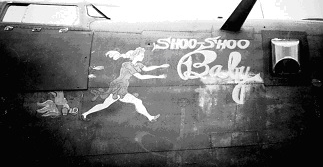 A restoration was undertaken between 1978–1988 at Dover Air Force Base, Delaware by the 512th Military Airlift Wing in an effort that tallied some 60,000 man hours, and the aircraft was flown to Dayton on October 13, 1988, restored as Shoo Shoo Shoo Baby. Put on display in place of long-time exhibit DB-17P 44-83624 (a converted B-17G that did not see combat), which was subsequently sent to the Air Mobility Command Museum at Dover Air Force Base (sans its top turret, which it gave up for the restoration of Shoo Shoo Shoo Baby) the reborn veteran can be seen today at the National Museum of the United States Air Force near Dayton, Ohio. The name has been restored to the original Shoo Shoo Shoo Baby and due to the amount of skin work required to restore its wartime appearance, it is finished in olive drab and grey instead of bare-metal as it was in operations. 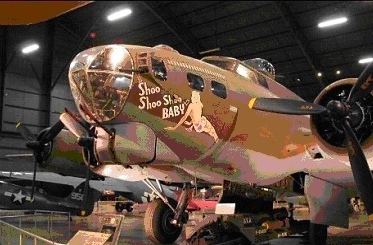 When the Memphis Belle restoration is complete, it will replace Shoo Shoo Shoo Baby as the museum’s B-17 exhibit. Your papa’s off to the seven seas. Without the help of the following ,this story would not have been written. I have a lot of unpublished photos about this aircraft and you are interested in them, let me know.